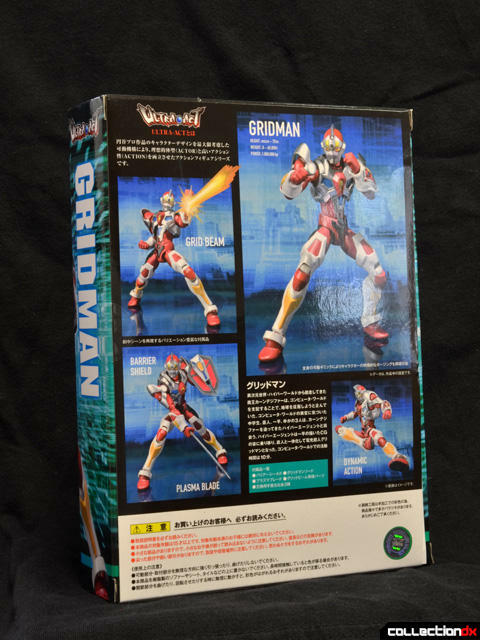 Gridman (aka. 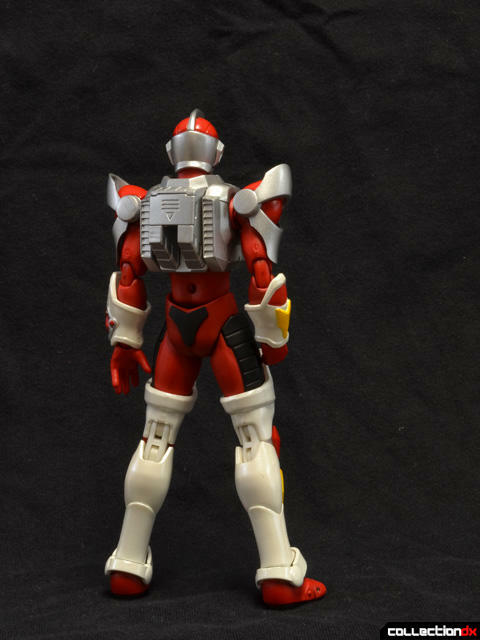 Servo) is the latest entry in Bandai's Ultra-Act line of highly detailed and posable tokusatsu characters. 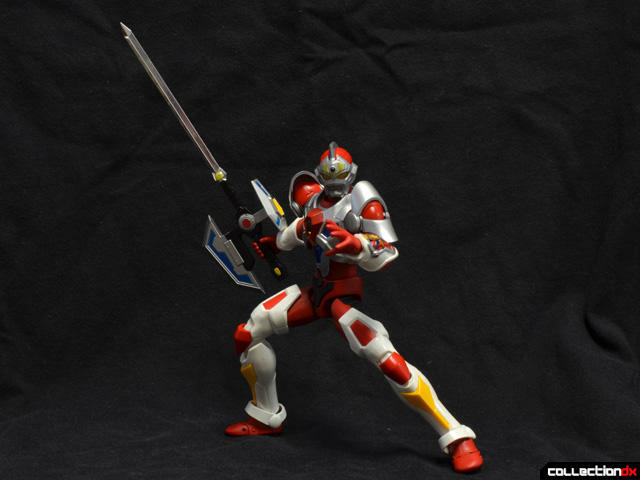 As soon as Gridman was announced I was scouring the internet for preorders because there was no way I was going to miss a new toy of my favorite Ultraman clone. 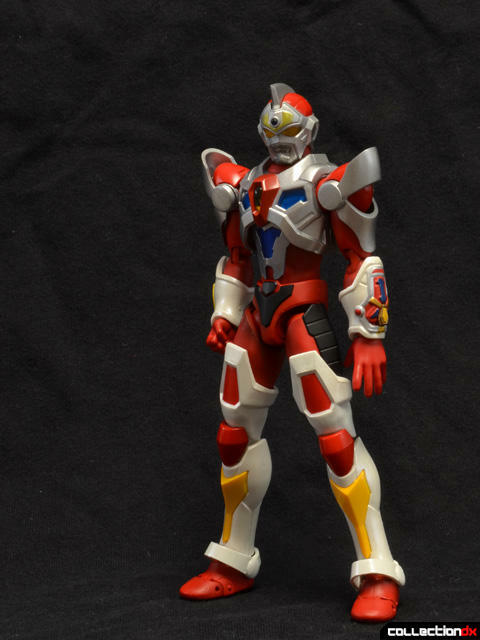 Gridman stands around six inches tall and is sharply detailed. 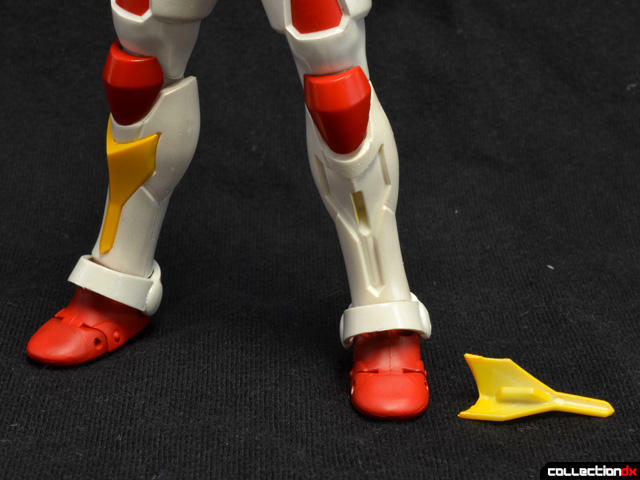 There are a lot more colors and details to Gridman's complex armor than the usual Ultraman or Bugman, and the only flaw I could find on my figure was a small red dot where the kneepad had rubbed against the front of the thigh. The figure includes four sets of hand: fists, splayed, tight grip, loose grip. After just a few hand swaps, the wrist ball joints are already showing stress marks, so I am worried they may break in the future. 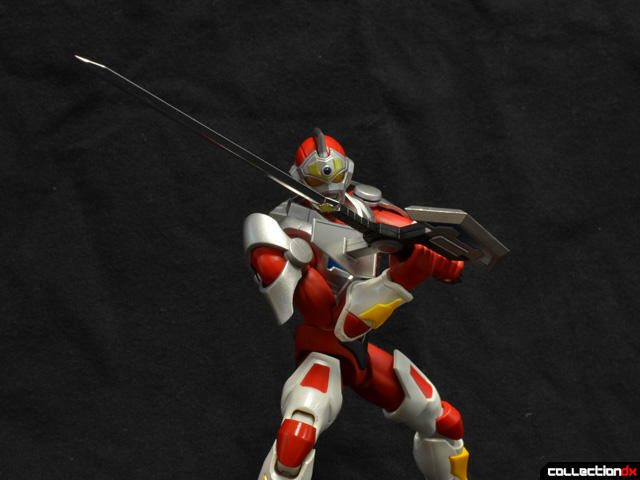 Ultra-Act figures are like Figuarts figures, and are designed to be supremely posable so as to be able to capture all of a character's signature poses. 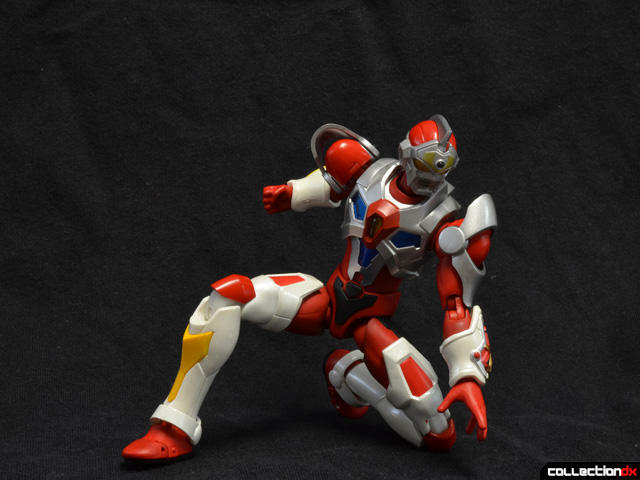 Gridman is a decent entry, but seems to have pretty limited motion in his torso, so he struggles at the Iron Man pose test. The shoulder pads are made from multiple parts so they can move with the arms while not restricting motion or looking like crap. The two silver parts are attached with a swivel joint to the red lumpy bit, which is mounted to a hinge above the shoulder. 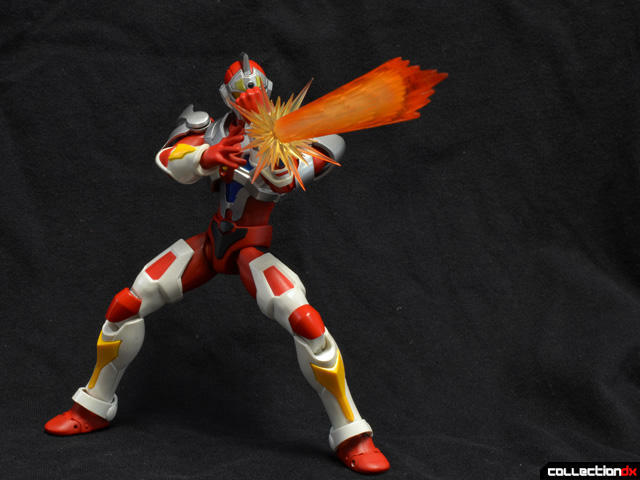 Gridman only comes with a few accessories, but the Spark Beam blast effect is the best one. The gem on the left gauntlet comes out, revealing a hole that the beam effect fits snugly into. The detail of the blast part is extremely sharp, and the whole part is made from hard plastic so it will not droop or deform. 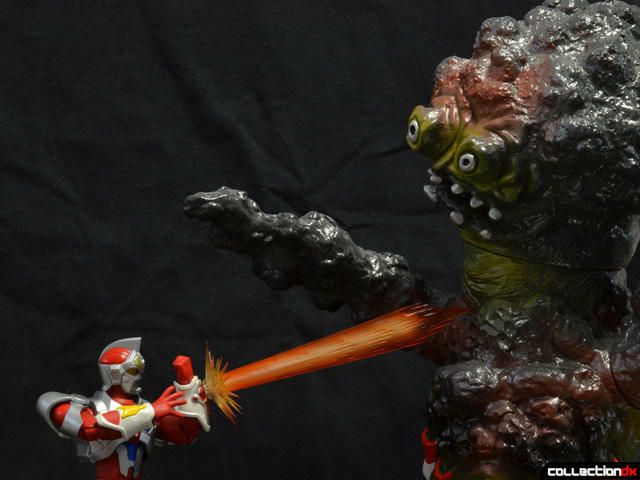 Blast effects are meant to be directed at kaiju. Gridman's deal is that he is an inter-dimensional police officer found inside a videogame programmed by three nerds, so all his enemies are computer-themed kaiju. A giant smog monster works just as well. Girdman's arsenal also includes the Plasma Blade and Barrier Shield. The blade is chromed and slightly springy, but the rest of the parts are made from a lightweight plastic that feels cheap and fragile. Getting the accessories into the gripping hands can be a bit scary. 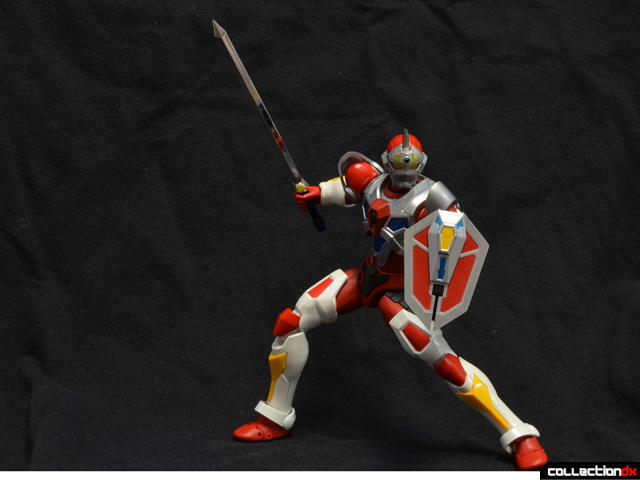 Still, an armored tokusatsu here with a sword and shield make for a great toy. 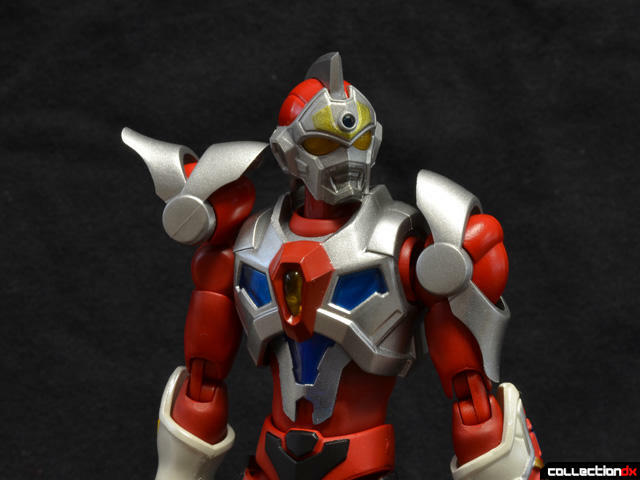 The original deluxe Gridman figure was well articulated for its time, but Ultra-Act are some of the most impressively articulated toys available today. 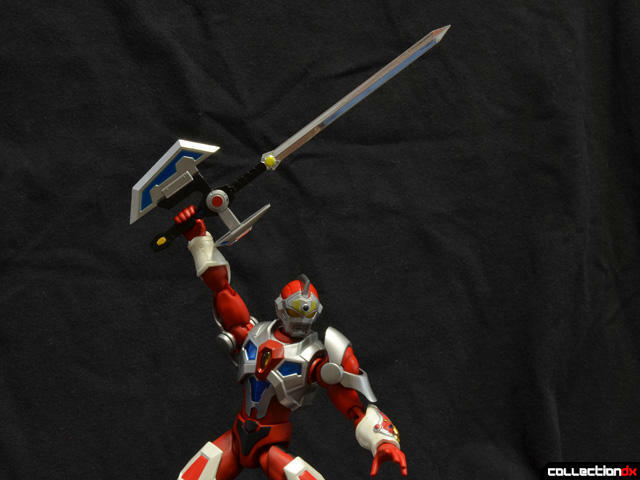 The Plasma Blade and Barrier Shield combine to form the Thunder Axe, not included, which then transforms into the Lightning Thunderbolt Gridman Sword, Gridman's final attack. The Lightning Thunderbolt sword looks good, but also feels fragile. 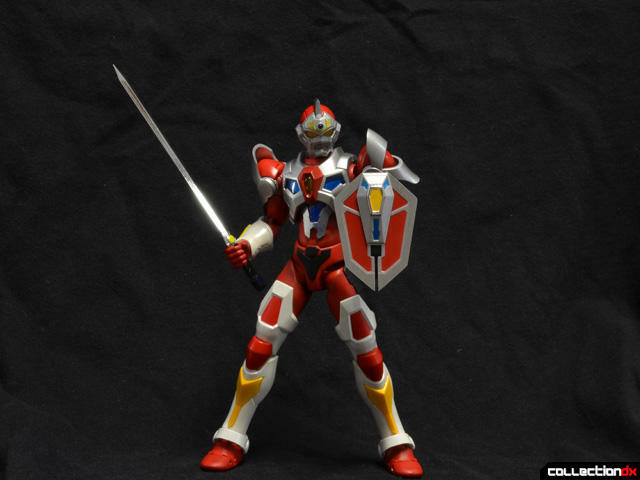 The bigger problem is that the design of the hilt and Gridman's lousy gripping hands make it so the sword is easily knocked loose. With enough patience, Gridman can still look good with his ultimate weapon. 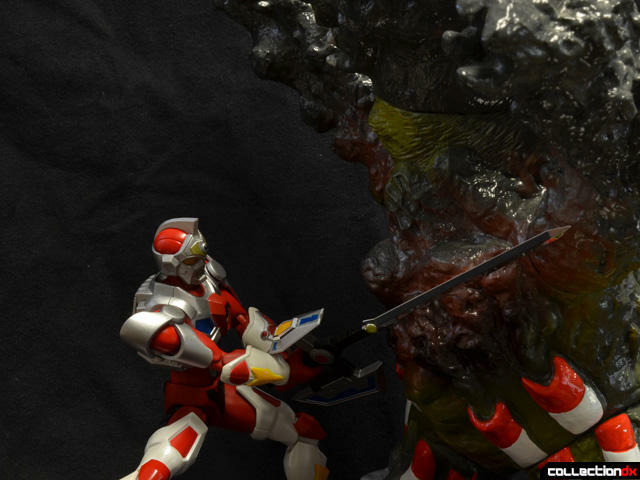 Again, tokusatsu figures look best when using their weapons on bad guys. 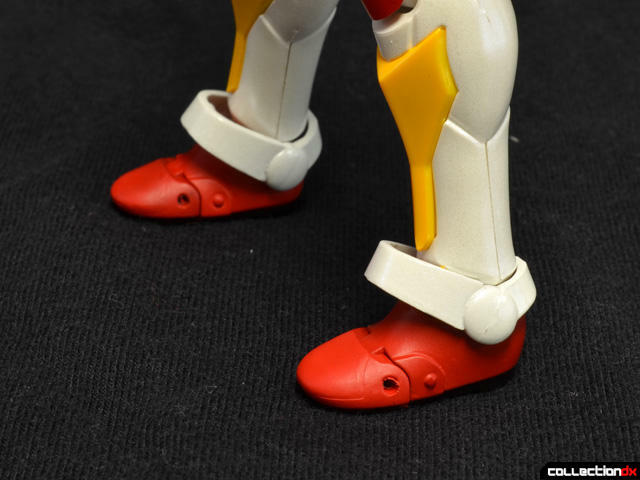 Worth noting is that the yellow detail on the shins can come off, hinting at how the previously teased armor sets might attach to Gridman. I will be picking those up, for sure. Ultra-Act Gridman is good, but not great. The stress marks on the wrist joints, the fragile feeling swords, and the lousy weapon gripping hands are all disappointing. Gridman spent plenty of time just straight up punching kaiju, though, so all is not lost. 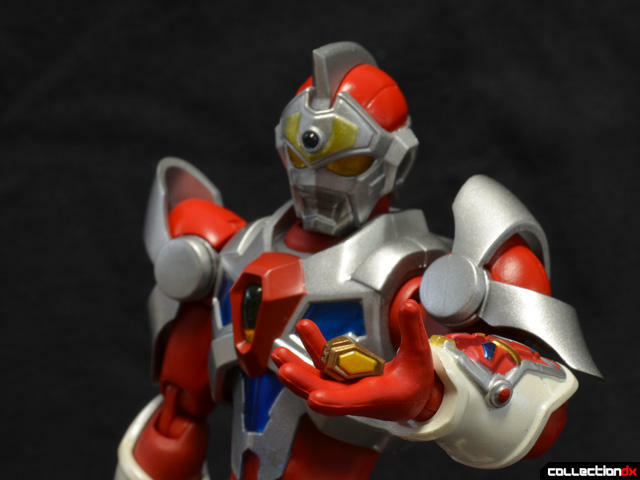 The detail is sharp and Gridman looks the best he ever has. Fans of the character should check him out, and the release of the two armor sets should make him an even more compelling purchase. That was another part of my childhood there. It would be awesome if all the mechs that combine with Servo gets available as well. Ah Superhuman Samurai Syber Squad. One of the two shows that featured Mathew Lawrence which I enjoyed. Don't forget Tim Curry!! Man, I loved that show. I actually STILL have a VHS of several episodes that I bought from Dollar General from WAY back. Wait. Tim Curry was in this show?! YES! Looks awesome! Doesn't sound like the downsides will bother me enough, and besides, like the end of the review suggests: I'm a fan of the character, and I will most certainly check him out! This'll be a much better replacement for the figure I never got back in the day. I think you mean 1993. Also Gridman's final attack isn't the big sword, it's the Grid Beam attack, ala Ultraman's Specium Beam. Anyway, Gridman is totally cool and Superhuman Samurai Syber-Squad is cheesy Saved by the Bell meets Ultraman fun. SSSS is coming out on DVD soon in the US at last! 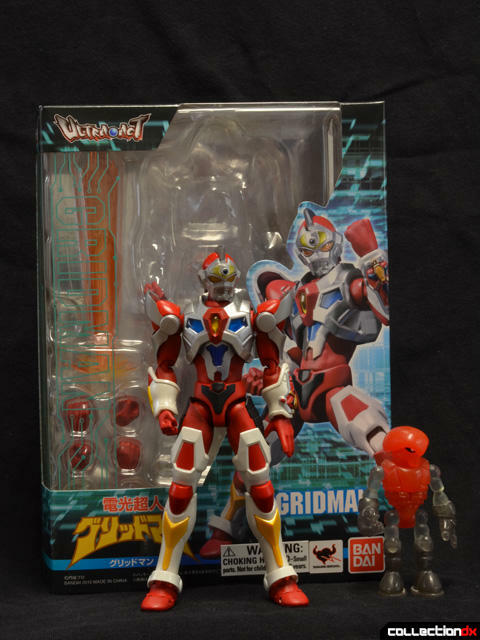 I was really surprised to see they're making Ultra Act Thunder Gridman and King Gridman (Synchrom and Phormo), too. Anyway, I'm pretty happy with this toy. Thanks a for the catch on the date. Not sure how I missed that! 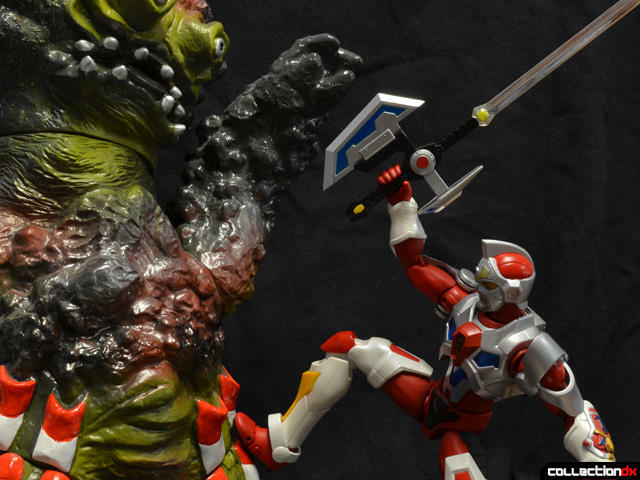 I'm waiting for BBTS to put up preorders for the two armored forms.